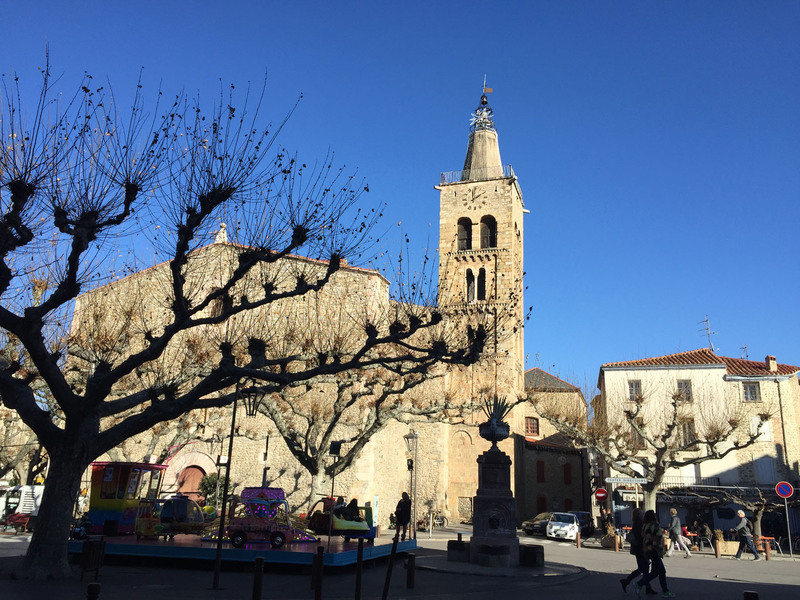 Leaving our chilly ski base in Les Angles, we retraced our steps back in the direction of Prades, this time with the intention of exploring the Languedouc-Roussillon region more thoroughly. We had always harboured dreams of buying a small place in France, and if we finally do, this particular region would be the most likely place for us to choose to put down our French roots. Getting a feel for distances, regional variations in terrain and typical village housing stock was a personal priority as we passed through. 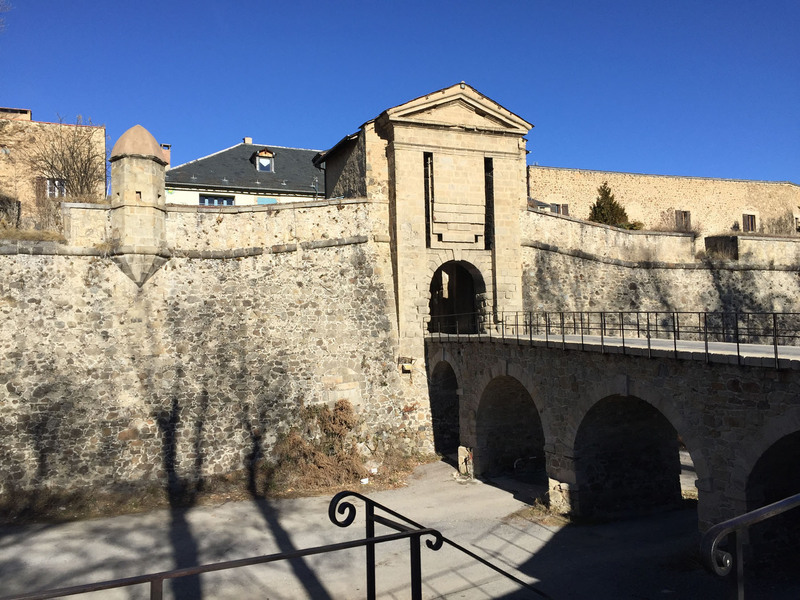 Descending from high altitude, we first reached the town of Mont-Louis , a designated UNESCO World Heritage site, one of twelve walled towns spread across France all grouped under the heading of ‘Vauban’s Fortifications’. Mont-Louis, geographically the highest fortified town in France, was created ex-nihilo and has maintained an unbroken military presence since its formation in 1697 CE. We parked outside the walls and walked across a narrow bridge, through a pedimented stone archway into the walled town. The air was still but chilled, and only a couple of other visitors were around. The town was mostly closed up, quiet and peaceful. We walked quickly to stay warm, exploring the shady streets and passing the stone-built church at the centre. We wandered over ramparts at the back of the town and up over an adjacent grassy mound, but signs suggested it was still an active military base and we should approach no closer, so we retreated back to the shaded cobbled streets. Mont-Louis was an historically interesting and important place, but at the time of our visit, in the chilly grasp of mid-winter and with the whole town closed, there was little to hold our interest for long. 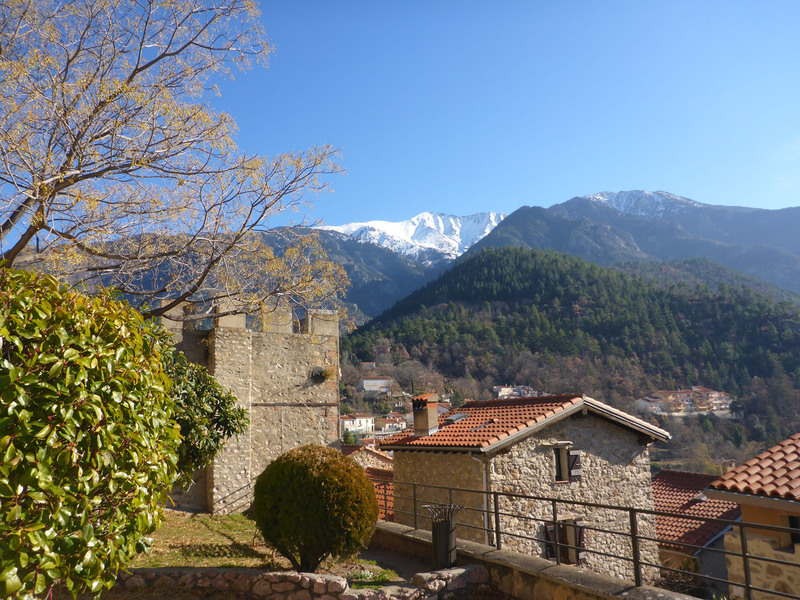 Continuing on towards Prades, we turned off the main road at Villefranche-de-Conflent and back into the green foothills, winding upwards to Vernet-les-Bains, a beautiful spa town with exceptional mountain views. We had previously looked into this village as a potential settling down place, nestled quietly between the sea and the high mountains. We had a long walk around to see what the town had to offer, and it was a lot. 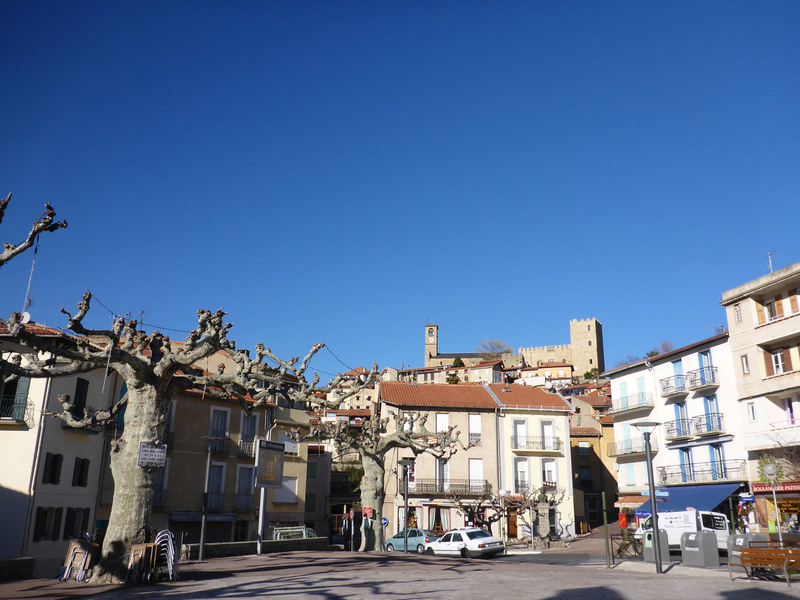 It was a beautiful village in a spectacular setting, with nice cafes and bars in pretty tree-lined squares. The only downside was that it seemed just a little too remote and detached so deep into the lush foothills, so facing the reality of the physical locale rather than a simple well-positioned location on a map, we reluctantly crossed it off our ‘possibles’ list. We had a brief look at Casteil, another village further up the mountain, at the end of the road. The village had two large tourist attractions, the Abbaye de Saint-Martin and an animal safari park, but the village itself was uninspiring in comparison to its neighbour. The free aire here was leafy and inviting, and it had originally been our plan to rest here for the night. But the weather forecast was predicting snow and high winds in the area, so we prudently decided to return to the valley to avoid any possible issues should the snow fall overnight. We drove further on, enjoying the wide straight roads and easy driving back in the valley. From here we entered into the rural quiet of the winding ‘Routes du Vin’ that passed alongside many small vineyards and villages; Millas, Montner, Estagel, all small towns built on the back of the production of quality local wines. All the vines were bare and grey, bent like giant, arthritic hands reaching out of the dark earth. 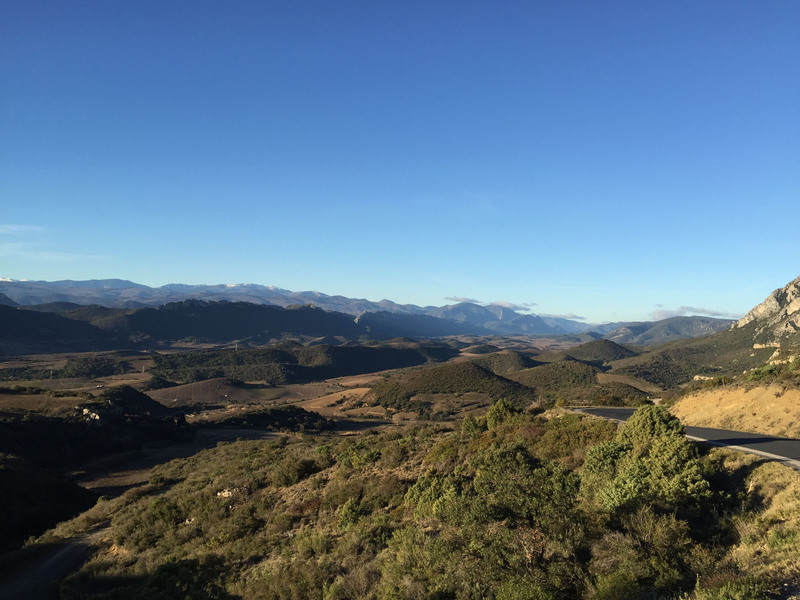 We turned off the main road at Maury, climbing north back into the high hills on a smooth, narrow road with a precarious edge that offered superb views across the valley below. 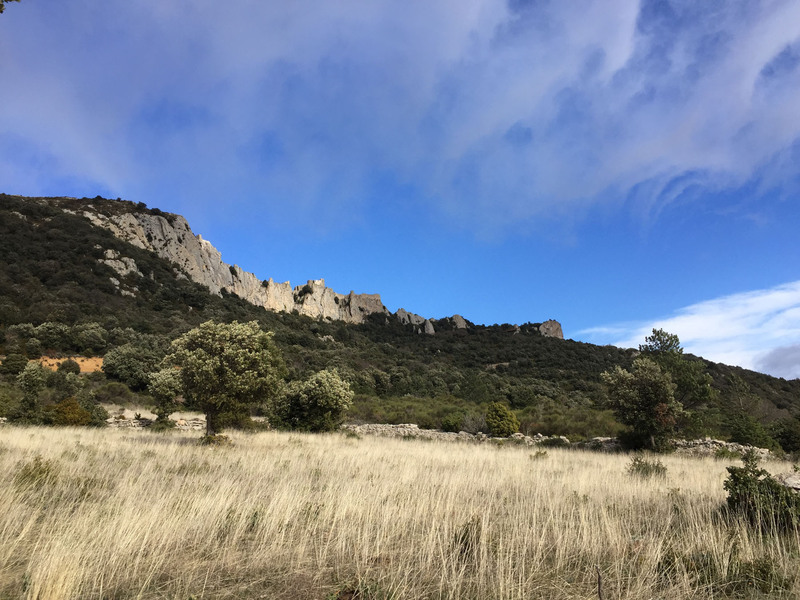 We passed the Cathar castle of Château de Quéribus on an opposite hill, first documented in 1020CE, looking impressively balanced on the high ribbed, vertical ridge. 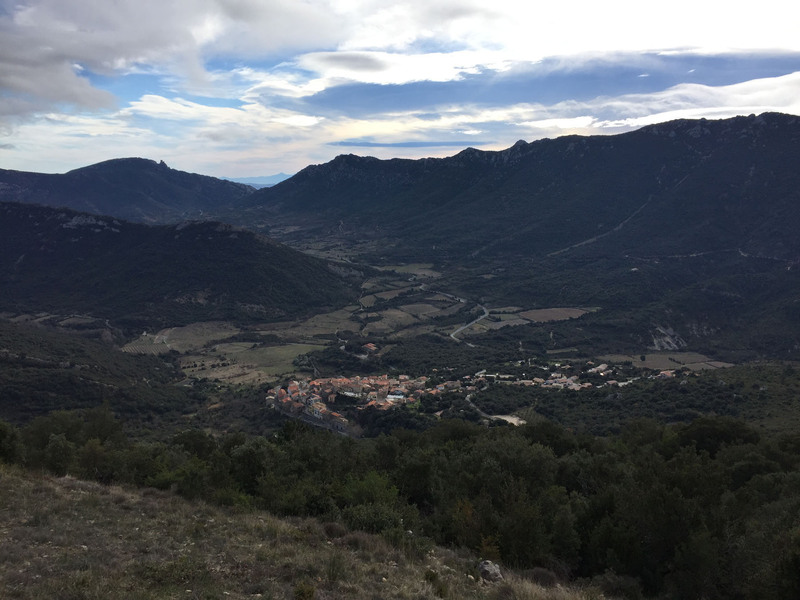 We continued on to a free aire deep in mountains at the town of Duilhac-sous-Peyrepertuse, passing through field after field of vineyards, many marked with large signs advertising the associated brand. 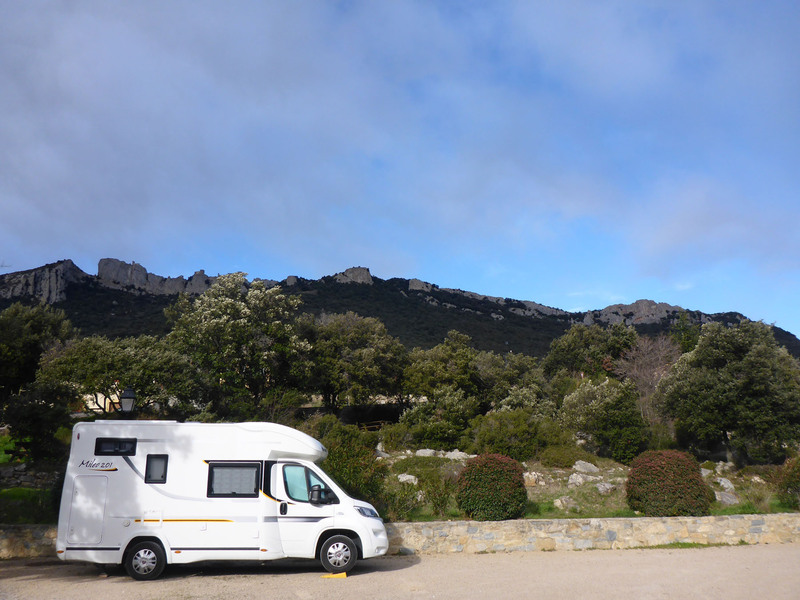 The aire had a clear view of our second Cathar castle of the day, the Château de Peyrepertuse. We walked a leisurely loop around town to see what, if anything, was open, and found nothing. We passed a square with a modern pavilion for performances and displays, and found the Town Hall, but one local man walking his dog was the only other person we saw. The town was scruffy and worn, but it had an underlying charm and a quirky interest at each turned corner. But a biting wind blew hard through the streets, so feeling chilled and beaten down we retreated back to Benny for the night. The following morning was clear and bright, with a sea of cloudless blue above us. 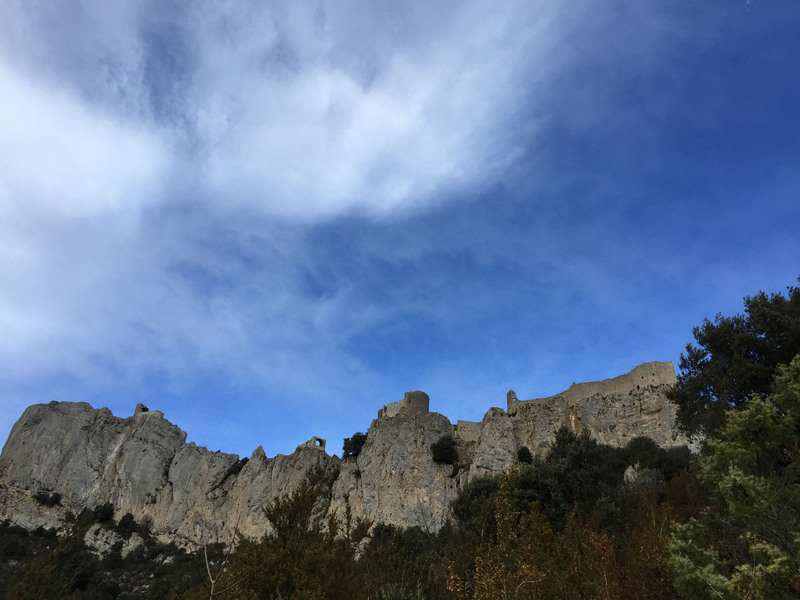 The wind was still blowing strong, as it had through most of the night, so we wrapped up tightly for our walk up the hill to the inviting Château de Peyrepertuse, high above us. We followed a well-marked local path, criss-crossing occasionally with the longer national footpath of GR-36, as we gained height through the wooded scrubland on the hillside. We broke free of the trees at a flat vantage point that offered views of the village below and the valley behind. This was also the designated launching point for those wishing to hand-glide back down to the green valley floor below, although not likely to be a popular choice in the 50mph+ wind conditions we experienced; it was sometimes difficult to stay upright simply walking. We eventually reached the car-park for visitors who drive up rather than walk, and saw a solitary car, no doubt an unfortunate staff member manning the turnstiles. We enjoyed looking around the entrance foyer and mild steel mirador point, but we didn’t go into the castle due to a lack of cash on us for the entry fee. We wondered briefly if we would have visited if we had had sufficient money with us; probably not, if we’re honest. If we diligently paid into every church, monument, abbey, castle, gallery, landmark and museum we passed on our travels, our journey would end much more rapidly than we wish; this walk was all about the exercise and the views. We descended instead by the unused snaking road, a longer but much smoother route. We passed a large grassy plateau that was utilised as overspill parking in summer and as a landing point for those hand-gliding down to aim for, when weather conditions are more suitable. 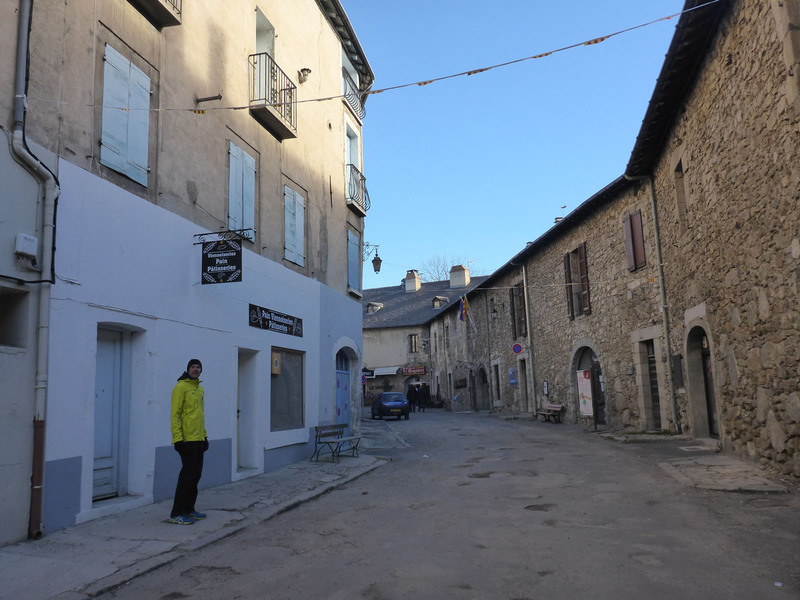 We arrived back in the village centre after covering around 7km uphill and back in high winds, bought ourselves a baguette and retired for the night, later to be swayed to sleep by the growing menace of the harsh winter winds. The next morning, stiff and tired from a lack of sleep due to the battering winds rhythmically rocking us and Benny like a cocktail shaker, we rumbled off, cautious and slow, back down into the sheltered valley and along to the market town of Quillan. We parked up in a quiet corner of the spacious, central bus station car-park and headed out to explore the town. This was another town that was on our mind’s virtual ‘possible places to live’ list, so we had high hopes and wished to give it every opportunity to impress us. 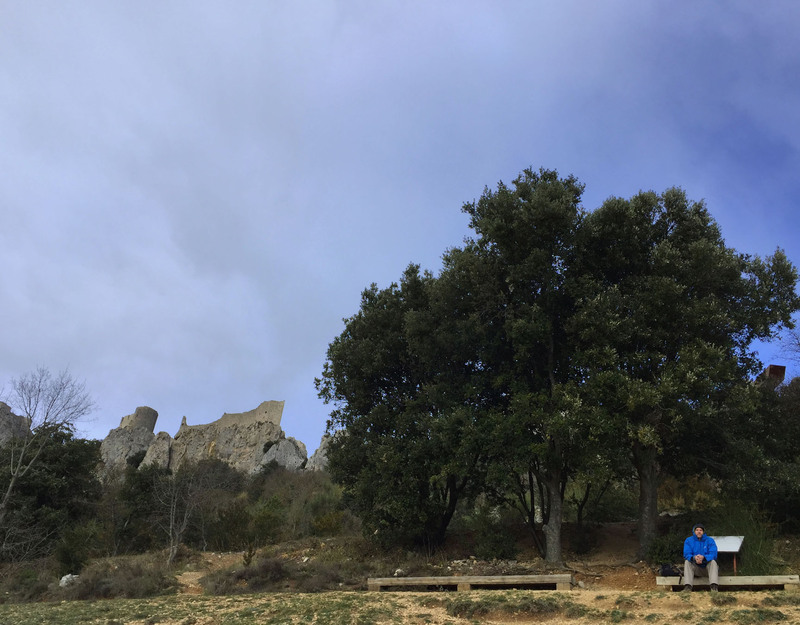 After a quick loop around the central streets, we headed across the currently tame and very low flowing Aude river and climbed up to a ruined castle on the hill, allowing fantastic views over the town and surrounding hills. The town looked much prettier from up here, with its red roofs, halo of mountains and centrally flowing river, but the reality of the small central streets was one of dishevelled, slow decay and a distinct lack of maintenance, and perhaps, money. There were many elements we liked, but others that made the location slightly less than ideal for us; a shame. 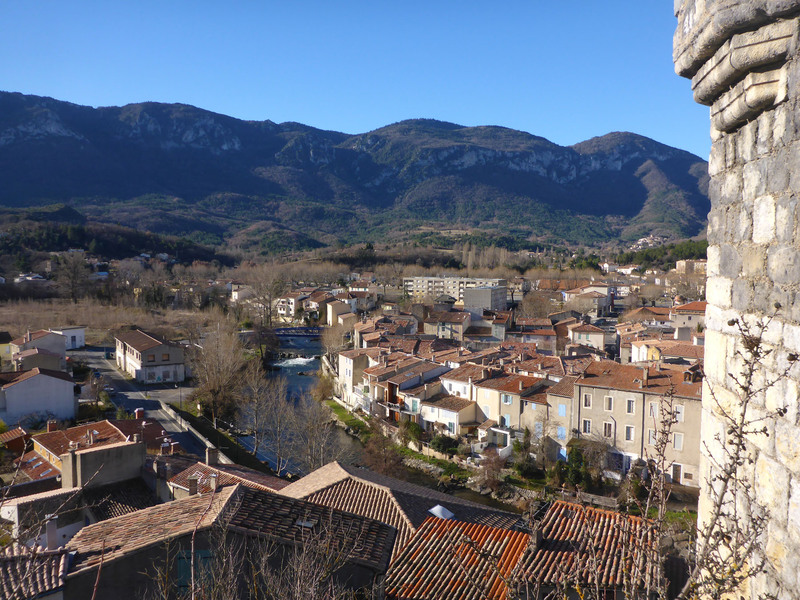 We left Quillan with a slightly disappointing feeling, maybe due to the high pedestal we had raised the town on to in our minds as our perfect ly positioned base. 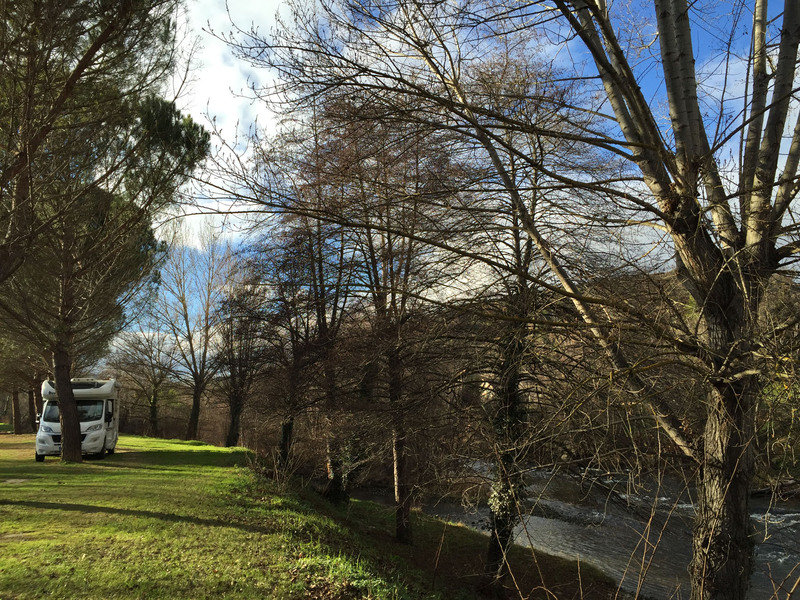 We drove to the next village to park up overnight, in a pretty aire with individual spaces set between plane trees on the banks of the river. 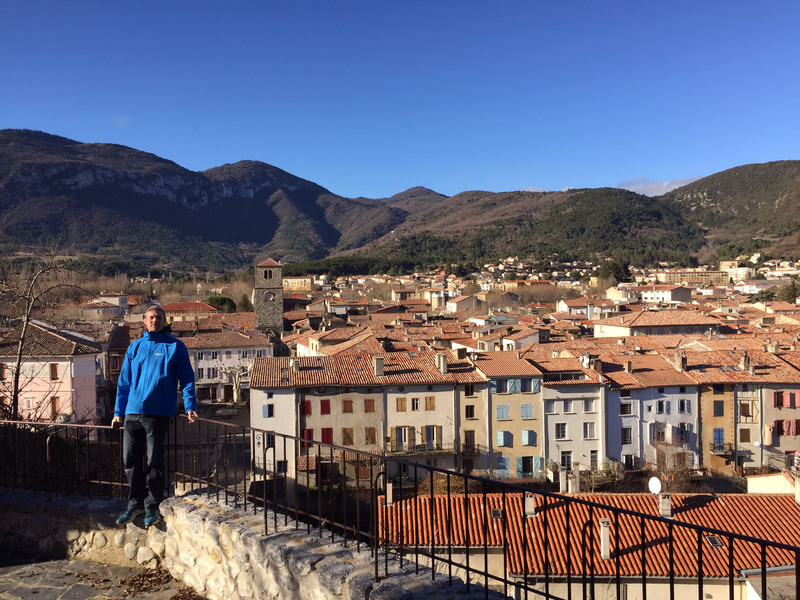 We explored the village on foot and, whilst similar in general disrepair to the streets of Quillan, we had a better overall vibe about Esperaza. The next morning we were off in the direction of Limoux, to catch up with Jan & Andy, friends made whilst staying in a campsite back in Spain, in the Picos de Europa. 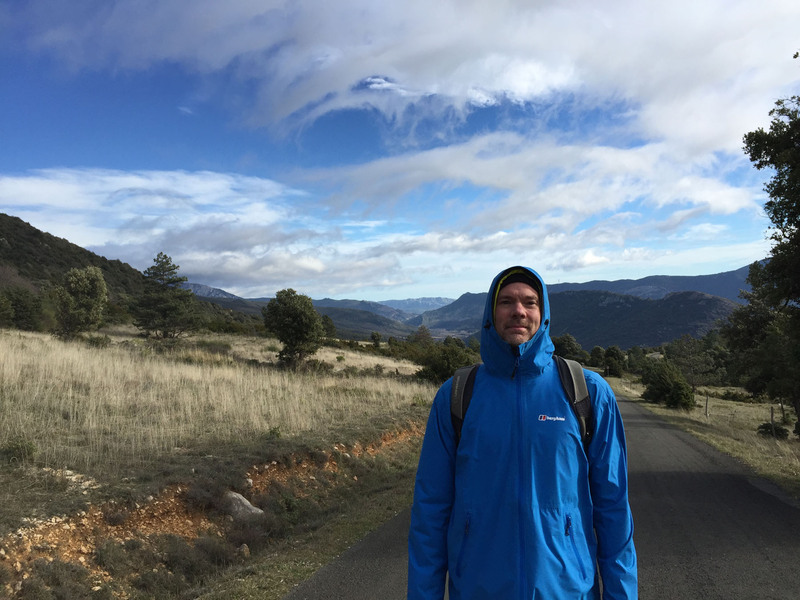 This entry was posted in France, In France, Our Travel Journal on Jan 22, 2017 by Aaron Hill.